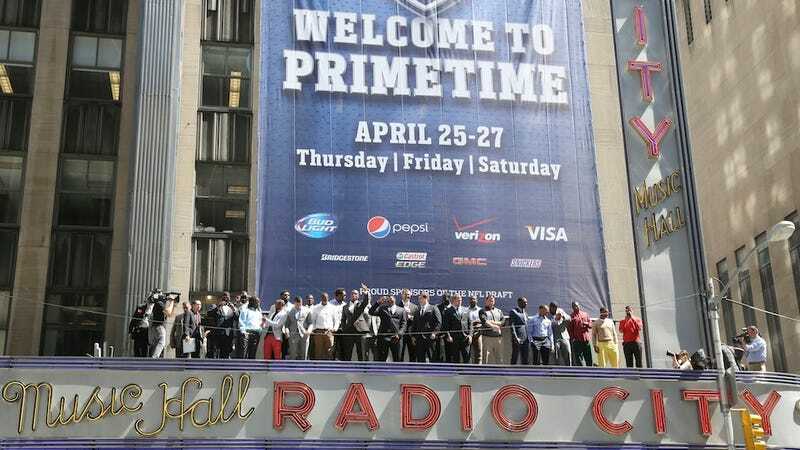 One consequence of the NFL's ever-swelling influence over American sports fans has been the transformation of the NFL draft from a curiosity that was fun to watch on a lazy April weekend into a three-day spectacle that occupies primetime programming spots on ESPN and the NFL Network. But the draft's rise in prominence has led ESPN and the NFL to confront a problem that many primetime television shows must face: spoilers. According to Sports Illustrated's Richard Deitsch, both ESPN and the NFL have agreed to put their NFL insiders on a Twitter hiatus during the draft, the point being to prevent them from tweeting out selections minutes before they are announced on TV. While ESPN and NFL Network will compete fiercely for audience this week, they have once again come together for a gentleman's agreement on the subject of tipping draft picks. Both networks have pledged not to show images of players on the phone in the green room at Radio City Music Hall. In addition to that, both networks tell SI.com that they will tell staffers not to report pick-by-pick selections on their Twitter feeds prior to NFL commissioner Roger Goodell announcing the picks on the podium. The Twitter edict will extend into the second round of the draft. Teams have 10 minutes to pick in the first round, seven minutes in the second round and five minutes for the rest of the draft. Sounds reasonable. I suppose a person could argue that ESPN and the NFL Network's reporters will be doing their followers a disservice by not sharing information as soon as they have it, but that person would be a prick. Do people really need to know what franchise-debilitating pick the Jets are going to make two minutes before it happens on TV? Even though I am always in support of people trying to undercut ESPN's stranglehold on sports broadcasting, I can't throw my full support behind La Canfora. Being exposed to a spoiler is almost as bad as having your wife's severed head delivered to you in a box. You know, like what happens to Brad Pitt at the end of Se7en.